Before setting goals let’s agree on what is meant and the types of goals we typically see in businesses. 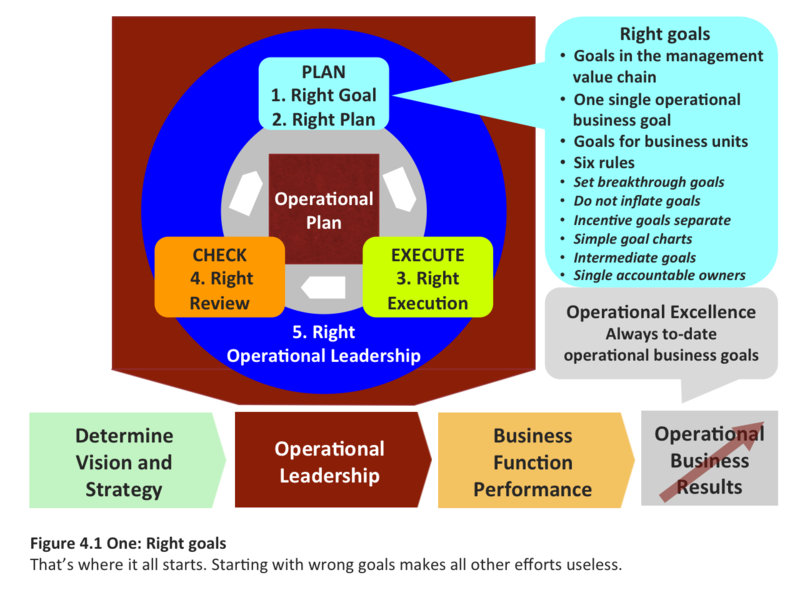 In this chapter, we will review how operational goals differ from strategic ones and how the various goal types are connected causally. Then, we make a bold statement: there is one and only one overarching operational goal in business: sufficient income. This one operational goal is the reason for being for all income generating business units. On the operational level your business has one single goal or business objective: to make enough money for now and the future. (E. Goldratt, The goal). In accounting terms this is sufficient profitable income, contribution margin, or EBIT. All income generating units must have their business objectives in the same dimension. Recognize such goals as necessary conditions, (called sub-goals or business objectives by some managers) which possibly are necessary to achieve the overall operational goal. maintaining the same level of operational come may be a breakthrough also, in some cases. In some cases managers tend to set higher goals for the business units reporting to them than they have themselves. With this practice they quickly arrive at highly inflated goals. (The planning principle in the previous Soviet Union). Do not do or allow this habit: Inflating goals just creates comfort at higher levels and permits upper level management to deny their duty of finding and resolving constraints in the business ecosystem. Sometimes you want to add incentive - like "challenge goals", "stretch goals", "special month goals" goals to operational goals. Don't mix these incentive goals up with operational goals. Why not say it in simple terms: "Our operational goal is 100 this year.If you achieve more, the company will grant a bonus of 10"
To encourage absolute focus on our operational goal use a masterpiece of simplicity and clarity as goal chart: in the graph, ONLY show your operational goal and progress to it, on a table below, show goals and results for sub-units. Do not add any other item to your goal charts. Mistrust hockey stick goals: only approve them if they been been checked for reality. Set goal seasonality right: inadequate reflection of seasonality in goals will weaken their ability to act as alarm signals.